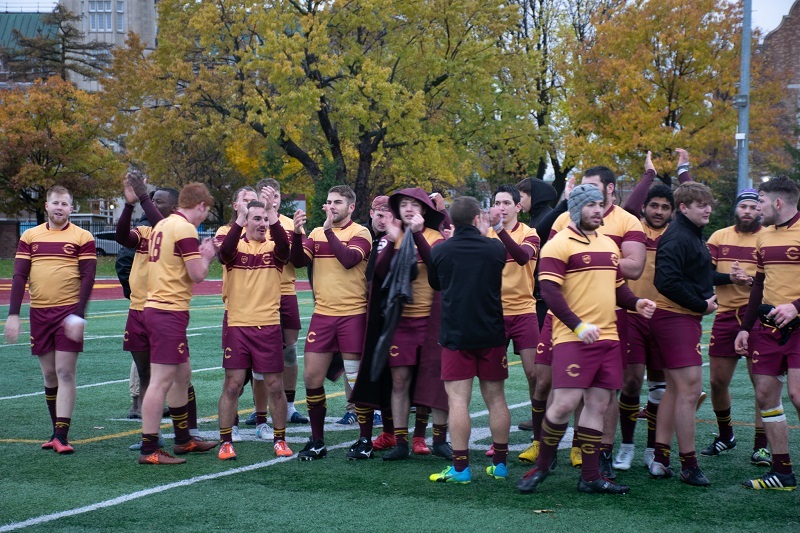 The Concordia Stingers men’s rugby team remains perfect and is headed to the Réseau du sport étudiant du Québec (RSEQ) final after beating the Université de Sherbrooke Vert et Or 17-0 on Nov. 3 at the Concordia Stadium. It was a cold and rainy Saturday afternoon as fans gathered to watch the semi-final. Although the Stingers hosted it at the Concordia Stadium, it almost felt like it was a home game for the Vert et Or, as there were probably more Sherbrooke fans in attendance than Stingers fans. The Stingers will host the Bishop’s Gaiters in the RSEQ final. Photo by Gabe Chevalier. Within the first minute of the game, the Vert et Or had a great chance to strike first. Sherbrooke’s Clément Tisnerat, awarded rookie of the year, blocked a Stingers kick, and tired to recover the bouncing ball and return it for a try. Instead, he tapped the ball forward and the Stingers regained possession. It was a defensive affair for most of the first half as the score remained 0-0 almost until the end, and neither defence gave up any ground. Finally, the Stingers got close to the try zone and capitalized. Eight-man Lucas Hotton was able to plow through several Sherbrooke defenders to take the seven-point lead. It was quite the physical game and both teams jawed at each other. Both teams did a good job of securing the ball considering how cold and rainy it was. Concordia extended their lead to two possessions, making it 10-0 as Moritz Wittmann kicked a drop goal early in the second half. During the later part of the game, it started to sloppy, as both teams seemed to be quite tired, letting scoring chances slip right through their fingers. Every time Sherbrooke marched down the field, the Stingers defense tightened up and came up with a big play—they simply would not allow the Vert et Or to score. This was representative of how their defence was all season long—they gave up less than 50 points in six regular-season games. Sherbrooke got frustrated at their inability to put points on the board, yelling at the ref and spiking the ball down. The Stingers’s Malcolm Baird ended up getting another late try to win the game. The Stingers will play the Bishop’s Gaiters in the RSEQ final game next Saturday at Concordia at 2 p.m.